As it turns out in the original Winnie the Pooh books by A.A. Milne, Rabbit doesn’t have a garden. I know, it kind of shocked me too. I grew up on Winnie the Pooh via Disney, and since Rabbit’s garden was such a big deal to him, I thought it must have been something that was at least mentioned. So I do apologise for whoever is wanting authentic, but sometimes you gotta run with what inspires you. 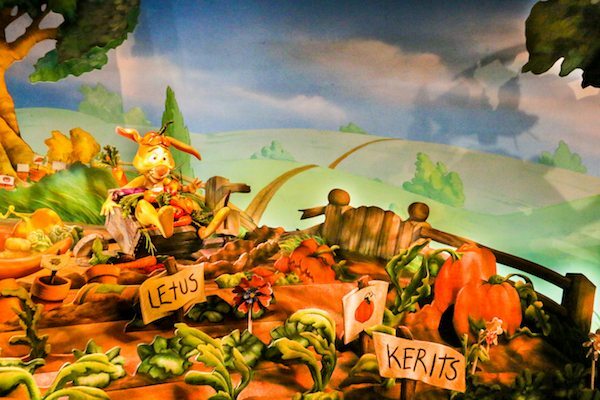 A recent visit to Magic Kingdom really inspired a lot of the elements that I used to create a ‘real world’ feel for Rabbit’s Garden Easter table. I didn’t want it to be cartoony, rather rustic, like Rabbit had let us borrow a few of his much loved garden tools. These are the main elements that pulled together Rabbit’s Garden. 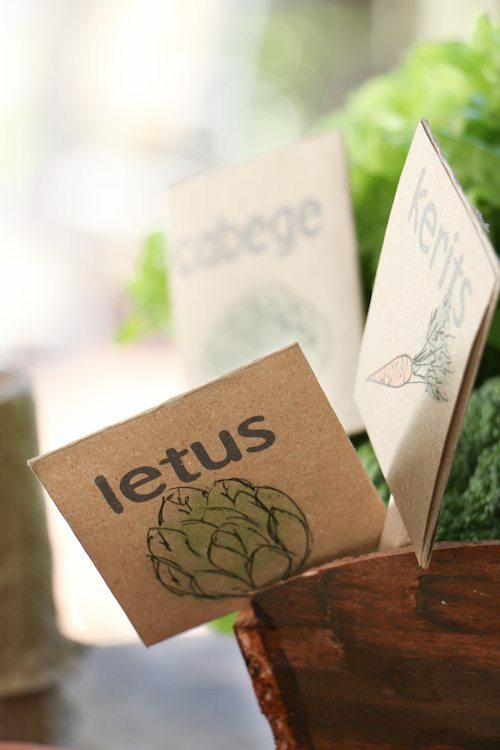 1) Handwritten vegetable signs. 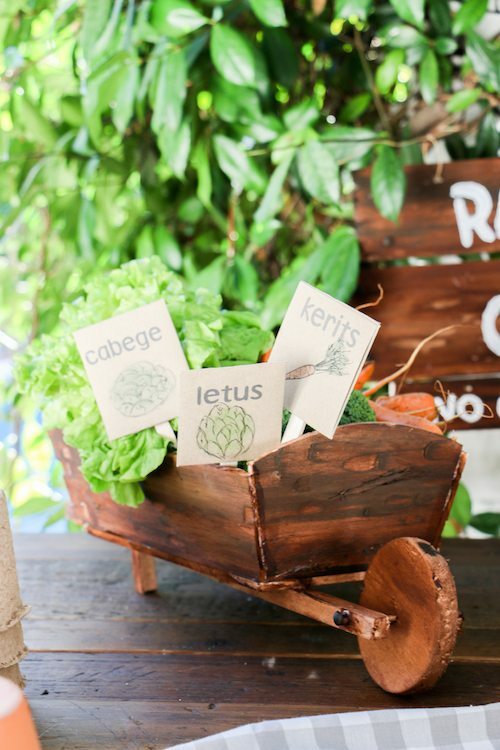 There’s usually a combination of written signs and image signs, so I printed child-like text on brown paper and hand drew some vegetables to look like country style seed packets, then glued them to Popsicle sticks. 2) Wooden wheelbarrow. 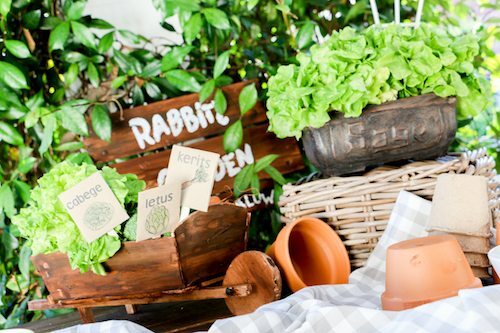 I always remember Rabbit with his wheelbarrow so made one out of balsa wood to hold a pile of veggies as the centrepiece of the table, with the vegetable signs sticking out. 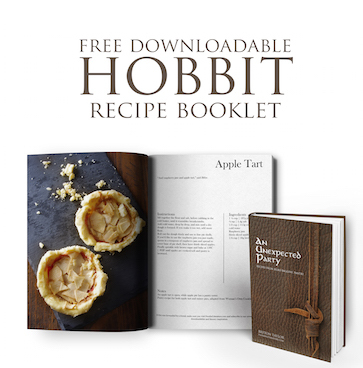 I actually have a how-to guide with a template coming eventually, but I’m going to bet I won’t have it up for Easter this year. 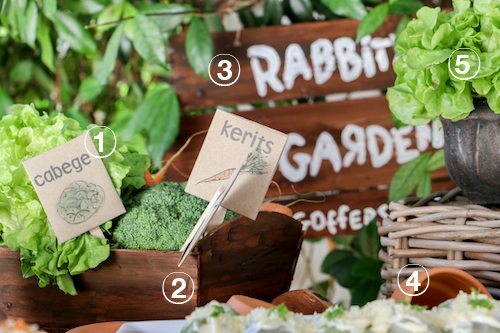 3)Rabbit’s Garden signage. 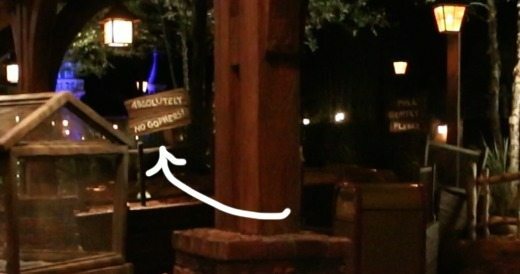 When you walk through the line a Magic Kingdom where there’s lot of interactive things (you can make carrots go up and down out of the ground, play musical fruit etc), there’s a sign that says ABSOLUTELY NO GOPHERS! 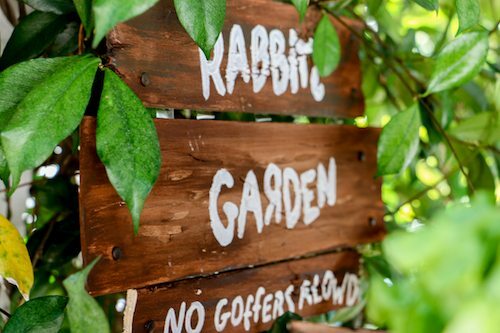 So using balsa wood again, I created a ‘Rabbit’s Garden’ sign that hung centre above the table, and the line below reads ‘No Goffers Alowd’ (I’ve seen Rabbit’s writing of ‘gophers’ in two ways and decided the word ‘allowed’ needed to be written like his vegetable signs, phonetically. Like the wheelbarrow, there’s a how-to guide that’ll go up eventually. 4) Terracotta pots. Like any gardener, I figured Rabbit might have a few of these laying around. Use brand new ones if you want to hold food, or just have a few laying around the table. 5) Lettuce instead of flowers. 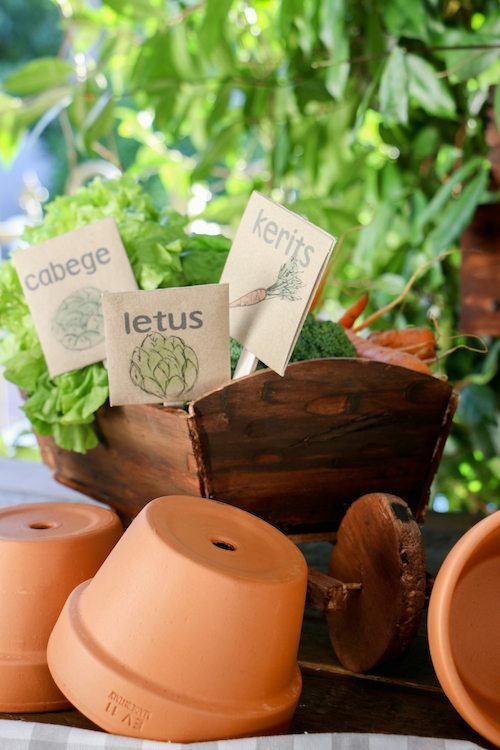 Like the Peter Rabbit Easter table set up, decorative butter lettuce was used in place of flowers. 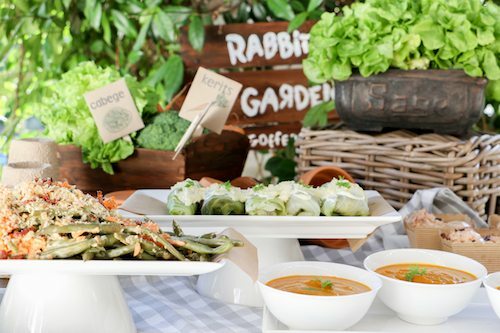 The Easter menu was inspired by the vegetables in Rabbit’s garden. 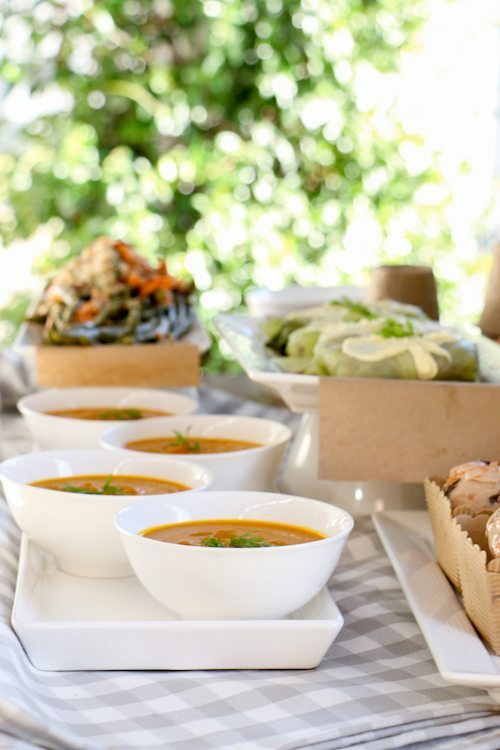 Healthy yet fresh and tasty. 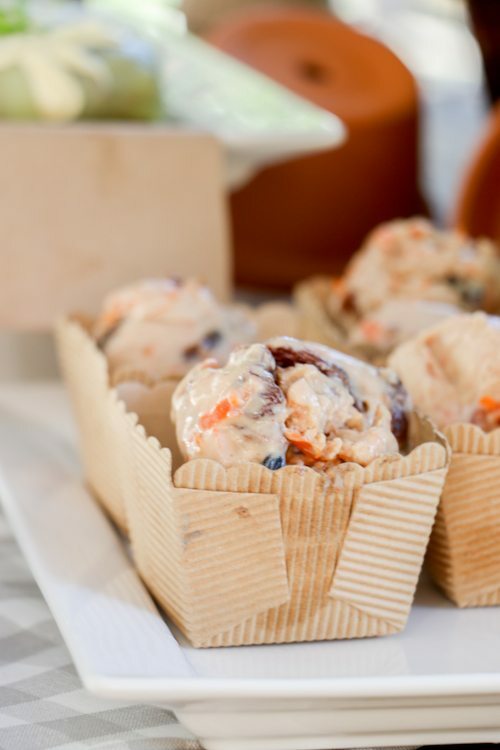 I loved being inspired by Rabbit’s love of his prized carrots, and integrated them in through a fresh carrot soup and the carrot cake ice cream, both heavenly. A green bean salad and cabbage rolls that uses cumin, fennel and green apple, gave a balance, and rounded it off the meal. This is totally awesome and very creative. OMG I like it very much. I would like to set up in my house. But can it grow with litte sun inside the house?